The ECO. AROMA Essentials 9 Pack contains 9 of the best-selling ECO. 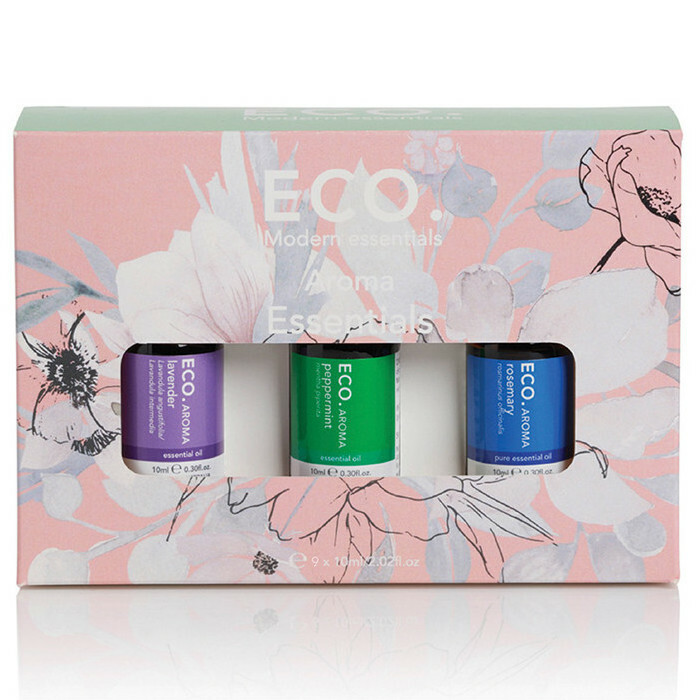 AROMA pure essential oils presented in a gorgeous gift box! 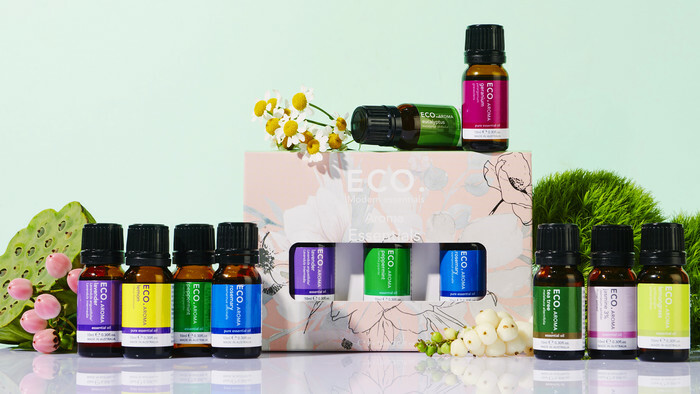 Filled with all of the basics, it is the perfect starter pack for anyone just venturing into aromatherapy, and also makes a beautifully thoughtful gift. A light, floral, woody scent. Nurturing, calming, soothing, antiseptic, antibacterial, antiviral, antifungus. Can benefit the skin, mind and body. Natural first aid. A sharp, fresh, intense scent. Aids digestion, astringent, anti-spasmodic, analgesic. Refreshes the spirit, stimulates mental clarity, cools the skin. A fresh, woody, outdoors scent. Invigorating, antibacterial, antiviral, decongestant. Ideal for skin, first aid and clearing air passages. A sweet, heavy, floral scent. Balancing, relaxing. Can benefit the skin, hair, mind and body. A pungent, lemony, herbaceous scent. Purifies, cleanses, detoxifies. Ideal for the skin, body and mind. An exotic, sweet, strong-floral scent. Skin-conditioning, soothing, uplifting. Ideal for dry skin. Lifts the mood. A light, refreshing, citrus scent. Uplifting, clarifying, astringent. Can benefit the mind, body and spirit. A fresh, antiseptic scent. Antiviral, antiseptic, antibacterial, antifungal. Ideal for skin and natural first aid. A refreshing, stimulating herbal scent. Enlivening, memory-stimulating, improves circulation. Can benefit the mind, body, skin and hair. Geranium, Jasmine Extract, Lavender, Lemon, Peppermint, Rosemary, Tea Tree Oil. Melaleuca alternifolia (Tea Tree) oil, Rosmarinus officinalis (Rosemary) oil. These oils are so divine! Bonus I got them on the sale price. They are beautiful and totally worth it! Excellent everyday variety to use in the home and body.